This is the voice of the digital-age customers. Customers, who are well-informed, smarter and have all the resources to pick the right product. Traditional marketing tactics fail to reach out to such customers. Three-quarter of customer distrust advertisements. It is easy to unsubscribe from intrusive or irrelevant advertisement, thanks to the plethora of extensions and add-ons available in the market. A content strategy is the unified actions planned to develop and manage content. It includes textual and graphical media and is done mainly for the purpose of generating leads to a business. Content strategy is a combination of analytical thinking and creative actions. Content marketing has come to the forefront because traditional marketing strategies are no longer working with the digital-age audience. The present day customers have far more information and have quick access to products. Content marketing helps reach and connect with such customers through multiple channels which spew meaningful information (content) about the products and its utilities to the target audience. One study conducted by Demand Metric found that 78% of CMOs believe that the future of marketing lies in custom content creation. Branded articles, videos, podcasts, infographics are the way forward in content marketing. Secondly, the same study found that customers tend to trust those brands more which create and publish branded content. The merits of content marketing said, it is also necessary that the marketing strategy is laid out to perfection, because, where there is no strategy, there is little planning, where there is planning, there is little hope for success. How much does your business plans to achieve with content marketing? Is it lead generation, brand enhancement or online presence maintenance? The goals need to be spelled out in correspondence to the overall picture. The goals will help the marketing resources and personnel work in tandem with a big picture. Content marketing deals with your end-users on a head-on basis. There are no intermediaries or filters whatsoever. The content connects with them on a personal basis like no other liner marketing material. So, the need to analyze and understand user persona is extremely important. Especially, if your product or service is relatively new to the market, focus on creating content that is educating and awareness creating. Create content that addresses the needs of a prospective buyer. 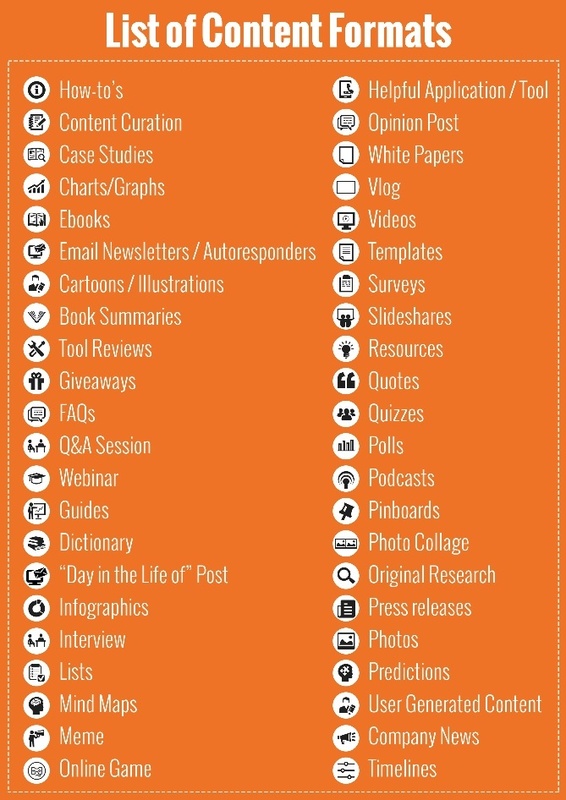 Content assets include blogs, videos, infographics, etc. Depending on your business and its targeted audience, the nature of the content will differ. For instance, for motorcycle helmets, an ideal form of content will be video reviews, tutorials and infographics. Textual articles and blogs will not yield the same benefit. Similarly, for a CRM software, the best form of content will be long-form, information-rich blogs and articles. Also, press releases about the latest releases can also enhance its brand image. Videos and infographics can be used as an extension to the textual content. A Content Management System helps create, publish, curate and monitor your content’s performance. It is almost a control console, the back-end where you can tweak the content extensively to make it appear appealing and engaging to the audience. A CMS is an integral component of the content marketing strategy since it arms the content marketer with the right set of tools to facilitate content marketing. Like we said before, content marketing is a combination of analytical and creative skills. You apply analytical skills to come up with campaigns that will click with your audience. You will have to analyze several metrics like keyword search volume, click-through rates, conversion ration among many others to have a grip on the industry. The results of the analytics will then be applied to forge creative content that will engage with the end user. 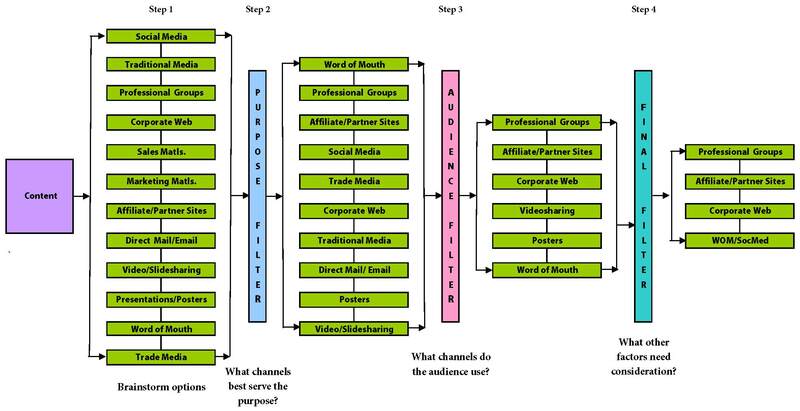 Here is a flowchart which shows how you can decide what content to use where to connect with your audience. With a quick and easy availability of CMS platforms and content creation platforms, there are several forms of content that you can use to create fresh content and to reuse existing content. While creating content, don’t restrict yourself to creating just one form of content. Try to attain diversity so that the audience find the content engaging and entertaining to connect with. One common mistake that most content marketers make is to create and publish content but to miss tracking its performance. How do you know which content is scoring high and which one is failing if you don’t monitor? Google Analytics and similar tools help you evaluate each content’s performance. Monitoring and tweaking content according to the performance helps sustain keyword ranking, website traffic and other key metrics of content marketing. Content strategy is a relatively new field. It has contrasting differences compared to traditional marketing strategies. These tips for crafting a content strategy for the digital-age customer will help you and your business grow an online presence. We know there is too much to digest, but with the right tools and creativity, a content marketing strategy can be executed to finesse.